We continuously improve our downhole motors and develop new products for oilfield unceasingly, such as angle adjusted (at group) downhole motor, high-power downhole motor, complex downhole motor and so on. As our products are designed, manufactured and inspected on the basis of the advanced computer system, their quality is well ensured. Our downhole motors have obtained 6 patents. Rugao Yaou Company is a major downhole motor manufacturer and supplier in China. We can produce various kinds of oil drilling equipment, including well cement tools, workover tools, oil production tools, and more. As a result of their reliable quality and economical prices, our products are very popular with customers in Russia, America, Germany, and Brazil, to name a few. For more product information, please contact us immediately! We will happily help you with whatever oil drilling equipment you require. Our full mechanical drilling jar is a downhole stuck freeing tool in drilling operation, which is connected to drill tool and works with drill string. 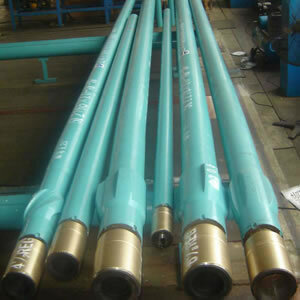 It is the preferred oil drilling equipment for directional well, complicated well and deep well.